Published in April 2018 for the 2018-19 program year. 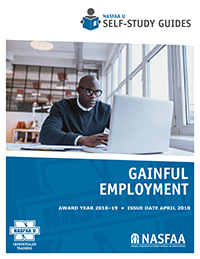 This self-study guide defines gainful employment (GE) programs and their intended purpose within the context of eligibility for Title IV program funding. Lesson One will review the definition and purpose of GE programs, and how a school can determine which of its programs qualify as GE programs. It will also review the requirements for certifying the eligibility of the school’s GE programs. The institution’s requirements for reporting on and certifying the eligibility of each of its GE programs. How D/E rates affect a GE program’s Title IV eligibility. Understand disclosure methods and effective dates.